I finished another cardigan, and I finally got the sleeves how I want them. This one is made out of some more fabric my friend Michelle got for me. It’s a jersey knit and is really too lightweight to be cardigan fabric, so I was worried about how it would turn out. But I actually like it and think it will be good for spring. It’s going to Riley Blake so I don’t get to keep it, but I want to. I made sure I wore it around on Saturday before I have to give it away ha ha. I didn’t have enough fabric to make ruffles on this one, so I did a flower instead. I am in love with flowers right now. They’re so easy to make, too. I used this tutorial to learn how to make them. After you know the idea, you can do all kinds of things by lengthening or widening the strip of fabric you use and adjusting how much tension you put on the top thread of your sewing machine as you sew. Oh yeah, and I sew my flowers onto my clothes with my sewing machine. It’s faster than hand sewing them and I think it’s sturdier too. 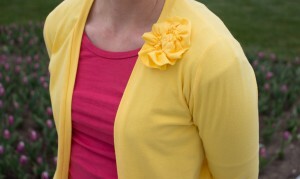 You can easily add flowers to store bought clothes too. So yes, they definitely rock. After making this, I think I’m in love with yellow now. I can’t wait until I burn through my current stock of fabric and can buy more because there will definitely be some yellow in there! 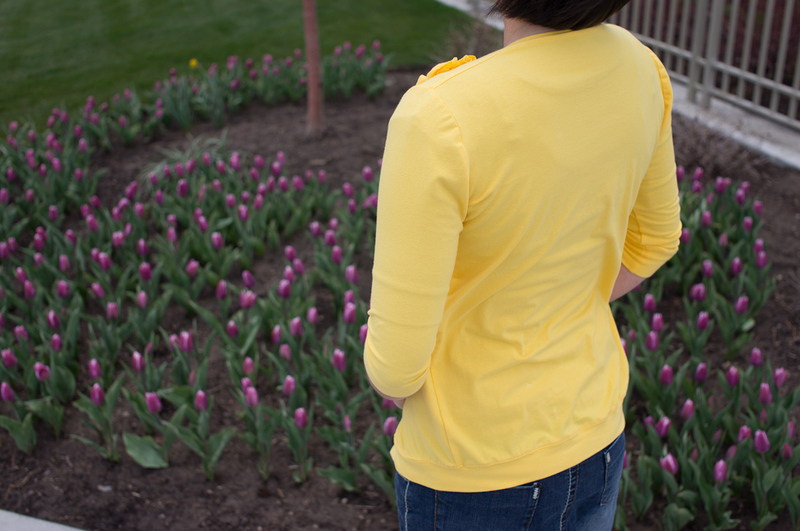 This entry was posted in Uncategorized and tagged Adding flowers to a shirt, Cardigan on May 6, 2013 by Bryanna. I agree. We need to see the model’s beautiful face. I absolutely love the yellow cardigan. This is way out of my era but it “rocks”. You have got to make you another one. I love you.